The concept of photocatalysis is not new, but the photocatalyst used for the process of photocatalysis is improving day by day. To take the concept of photocatalysis in advanced manner, titanium-based mixed metal oxide nanocomposites photocatalyst has been introduced in the field of photocatalysis. A brief study on the photocatalytic activity of the titanium-based mixed metal oxide nanocomposites (by categorizing blockwise into s, p, d, f groups) has been given in this chapter. The mechanism behind the improved photoactivity of the nanocomposite, due to the efficient charge separation at the heterojunction interface, is summarized. Various structures adopted by titanium-based mixed metal oxides like perovskite, pyrochlore, ilmenite, etc. by considering their ionic radii are reviewed here. Morphology, surface area, lattice and energy level matching etc. are some of the key factors responsible for the improved photoactivity with examples are discussed briefly. The photocatalytic activity of mixed metal oxide nanocomposites beyond titanium is also reviewed here in the last section. 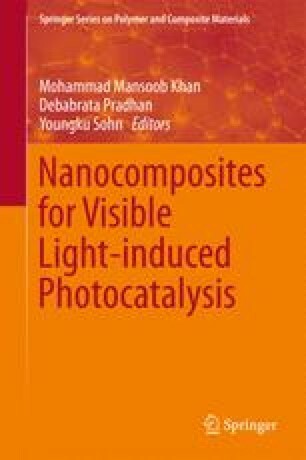 This book chapter may give a new insight for the development of research on nanocomposite in the field of photocatalysis as well as other fields such as supercapacitor and sensors.